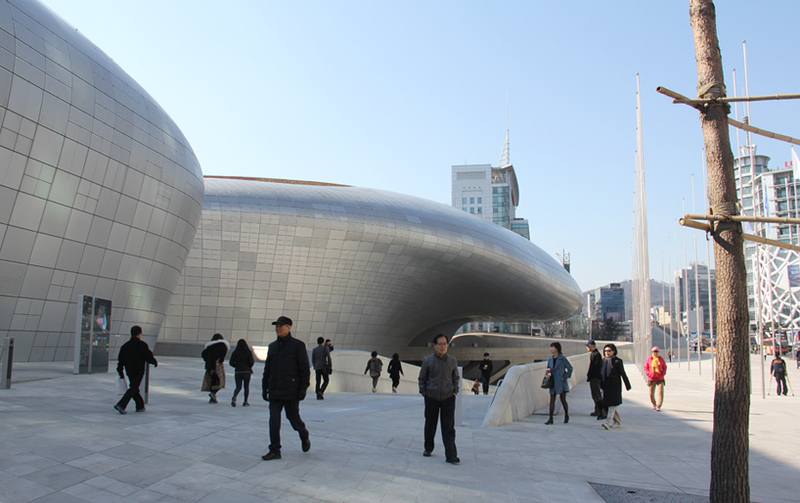 designboom travelled to seoul to attend the official opening of zaha hadid’s ‘dongdaemun design park’ (DDP) on march 21st, 2014. seven years in the making (see designboom’s visit to the site in 2009 when it was in its early phases of construction here) the building as a multiplex cultural space that serves as a communications center and study center for members of creative industries, as well as the public, offering an open work space in which to provoke thought. 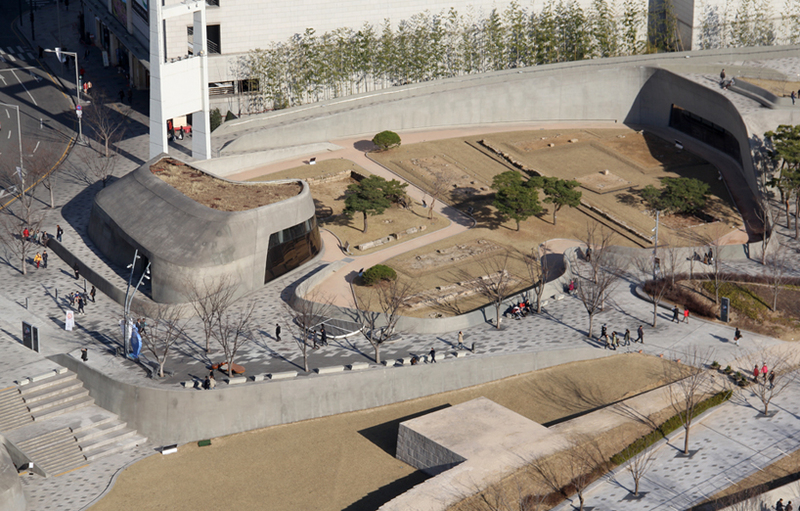 conceived as a metonymic landscape, the ‘dongdaemun design plaza & park’ integrates historical, cultural, urban, societal and economic elements into a single volume that offers spatial flexibility of the building and onsite park through the expression of a fluid sloping form; blending and restoring the relationship between humans and their environment. 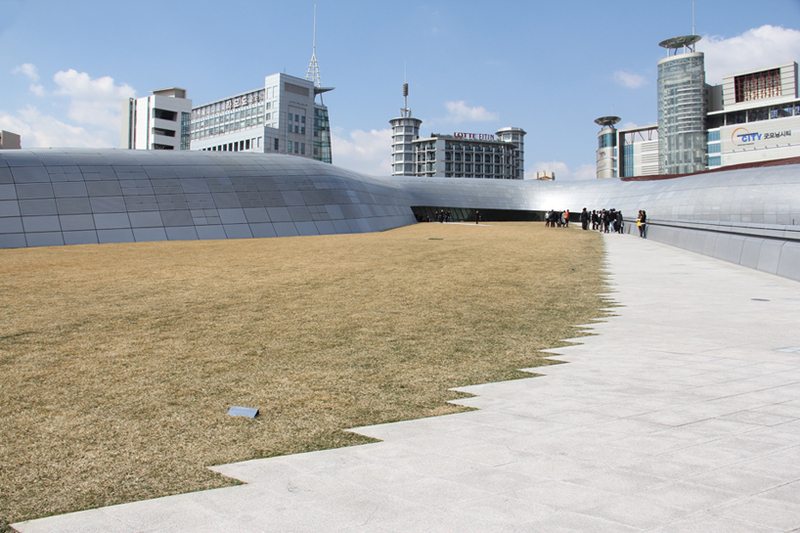 the complex is composed of five main programs: a biz center, convenient facilities, museum, park and art hall, the latter occupying the majority of the site housing two open studios and a council chamber. 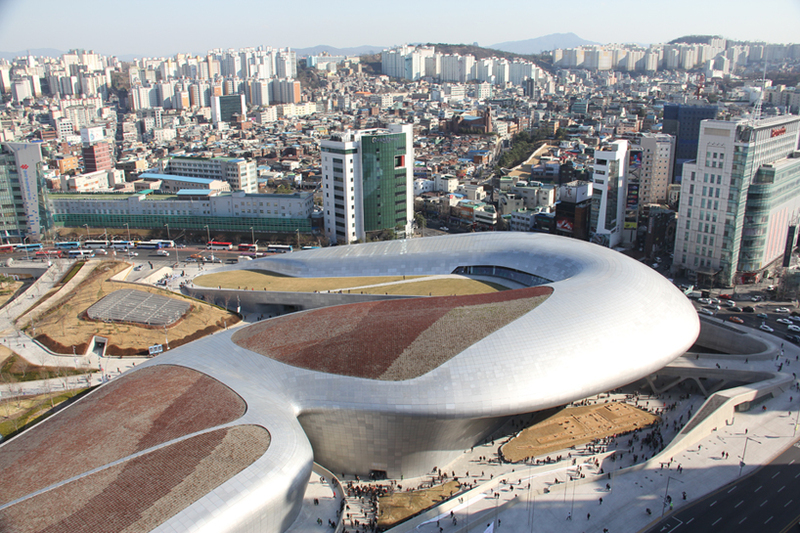 open studio 1 (2,991 m2) serves as a 1,500 seat multipurpose studio is equipped with media facilities and an interpretation system of six languages, and stands as a presentation area for fashion shows and movie premiers; while open studio 2 (1,548 m2) is a 1,000 seat multiplex service that has been designed to have food and beverage service capabilities. 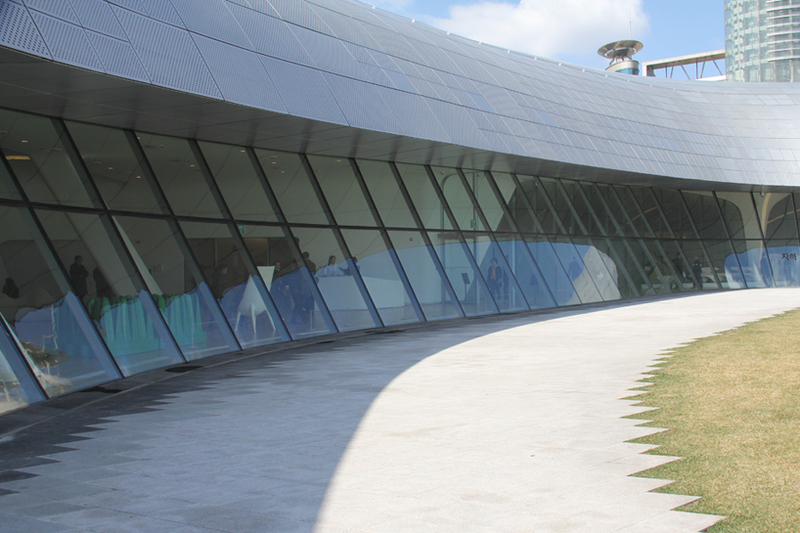 the council chamber (414 m2) is a 200 seat conference space for seminars, workshops and small events. 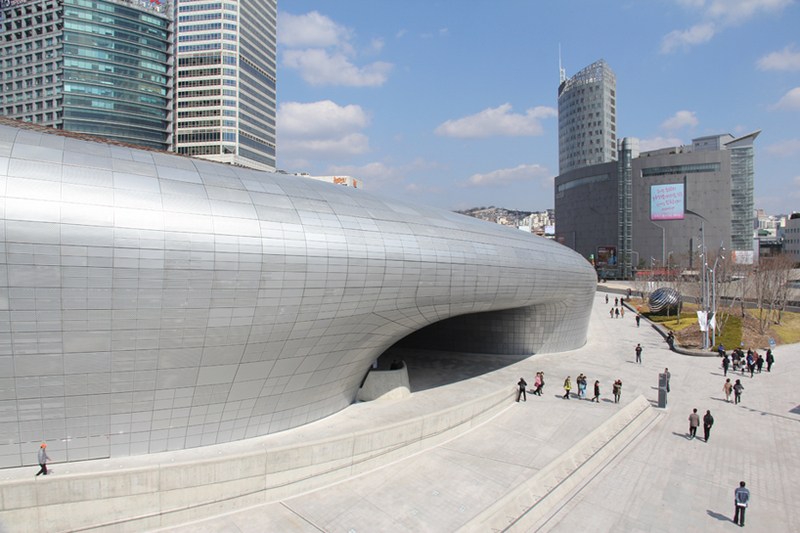 the biz center contains the biz street, trendlab, designers lounge and education space: biz street (6,187 m2) is a business space that consists of design library and design art shop and is meant to encourage the meeting between creative experts and city citizens; the trendlab (6,187 m2) is a zone for discovering material developments of dongdaemun’s fashion industry; the designer’s lounge (579 m2) on the 4th floor of this area offers a comfortable place for DDP visitors to relax; and the education space (1,094 m2) serves various programs including lectures, discussions, and workshops that are meant for experts, employees, students and local residences. 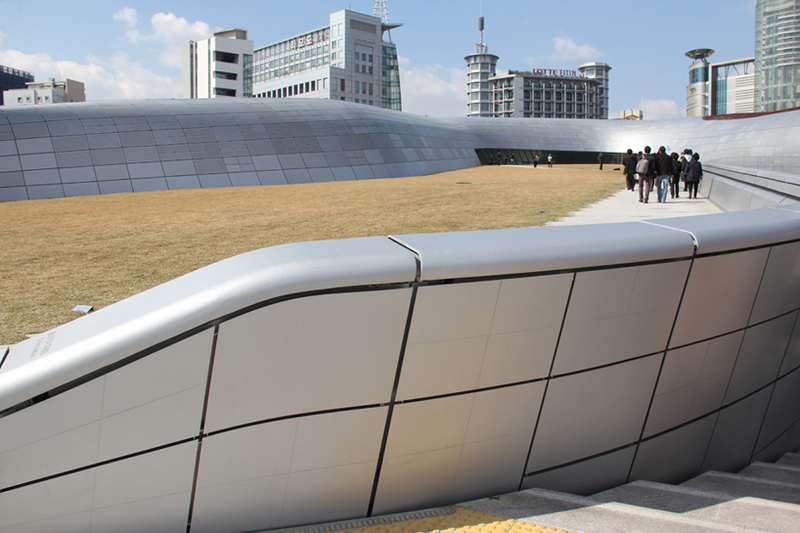 convenient facilities take up a 8,010 m2, connecting the cultural multiplex to the dongdaemun history and culture park subway station, occupied by substantial retail areas to experience design lifestyle through food, beverage and beauty. 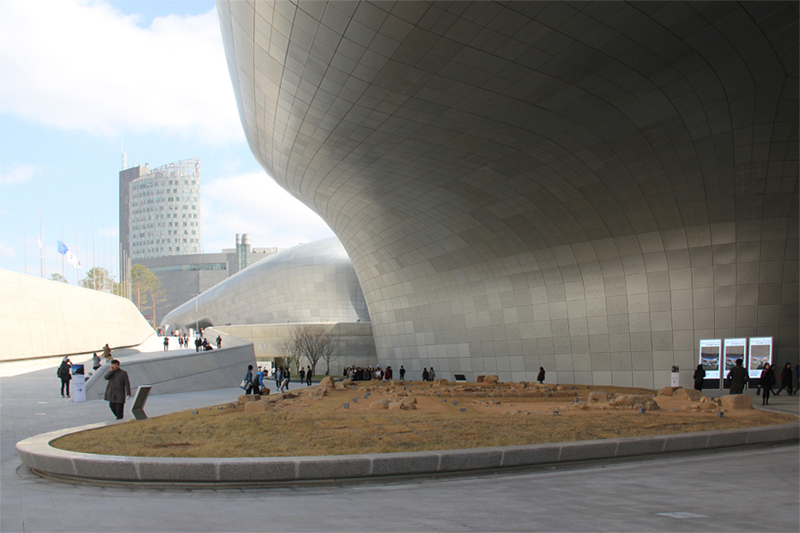 the museum is comprised of the planning exhibition hall, design museum, design dulegil (look around path) and imagination experience hall. 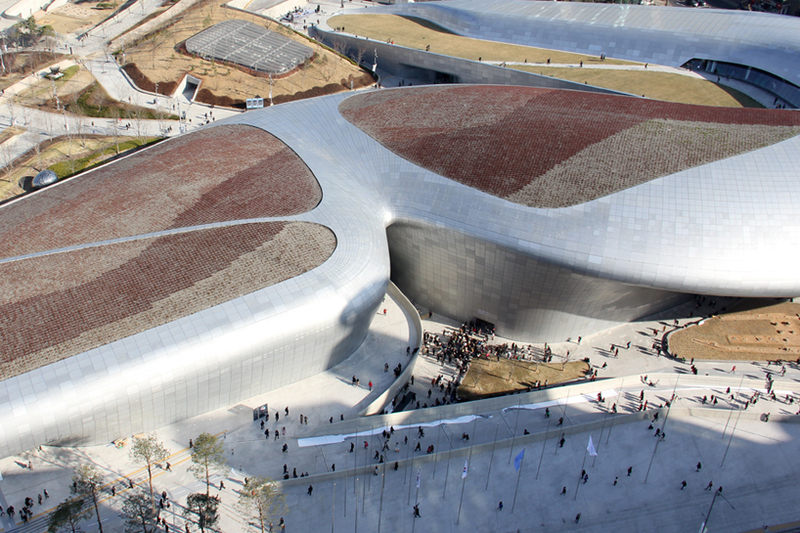 the planning exhibition hall (1,216 m2) is located below ground and specializes in showcasing fashion and trends in the design industry. 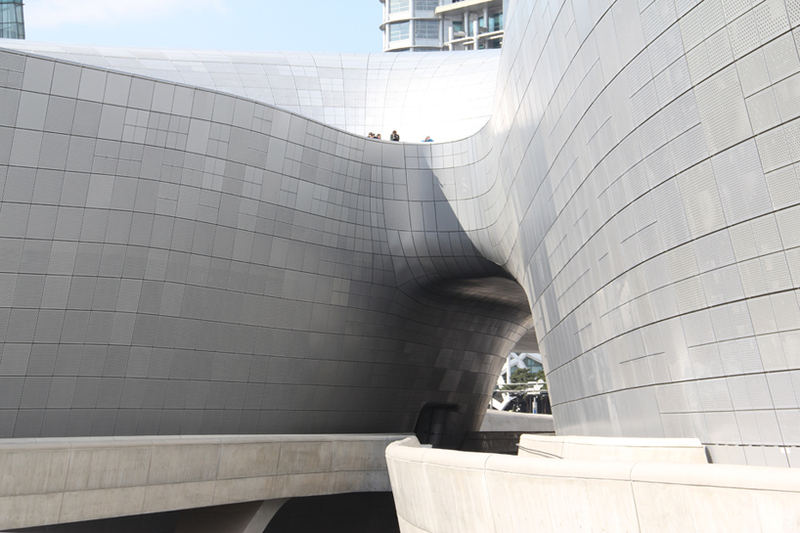 the design museum (1,462 m2) introduces to the public content related to expanding creativity and the spirit of korean design to the world. 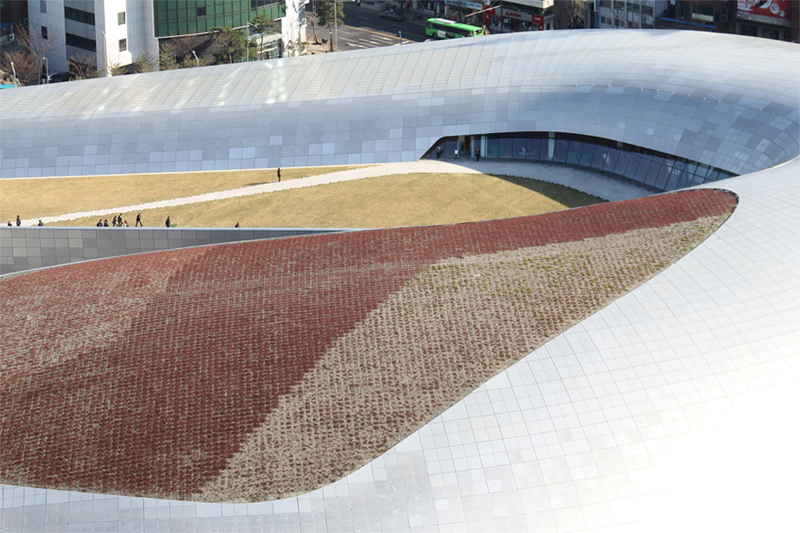 design dulegil (3,358 m2) connects basement 2 to floor 4, connecting all exhibition areas. 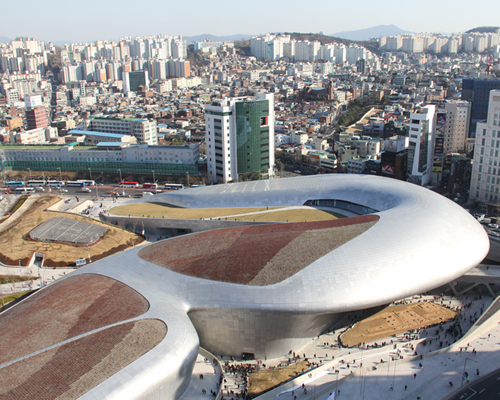 the imagination experience hall (1,892 m2) is organized for programs catering to children and the younger generation, equipped with many interactive hubs. 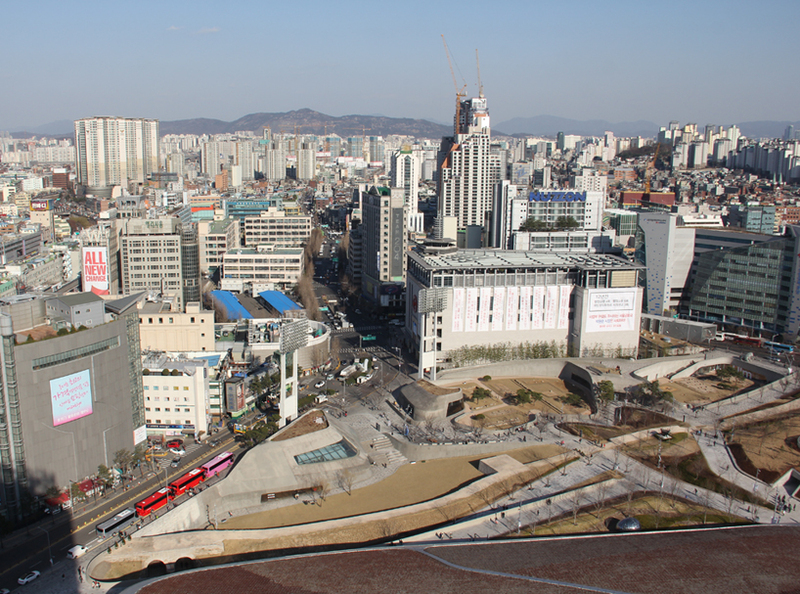 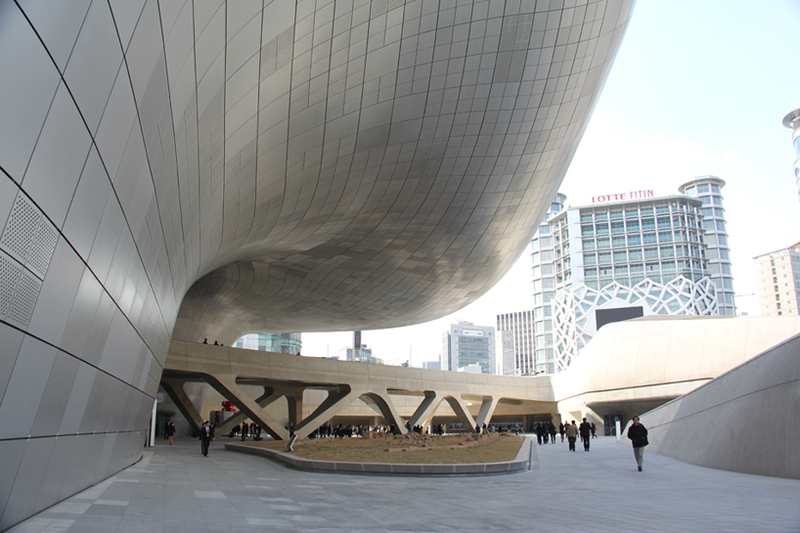 finally, the dongdaemun history and culture park (1,858 m2) is open to everyone. 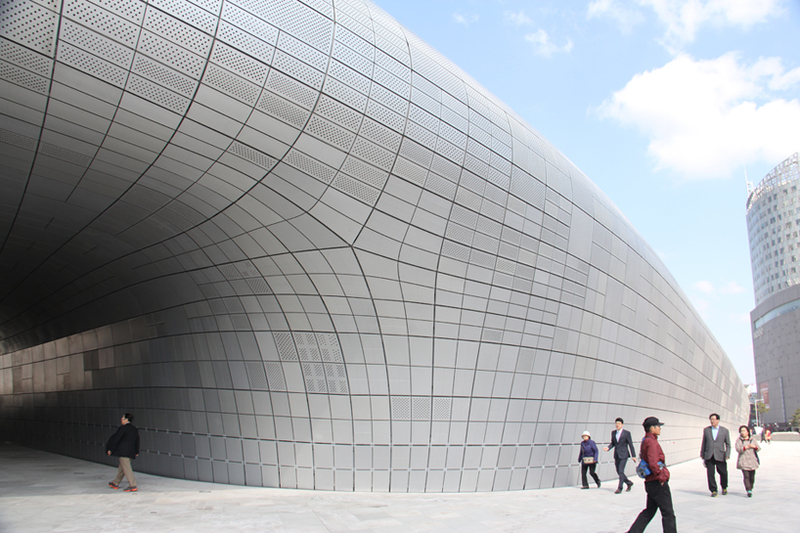 it includes an event hall, design gallery and gongdaemun history hall. 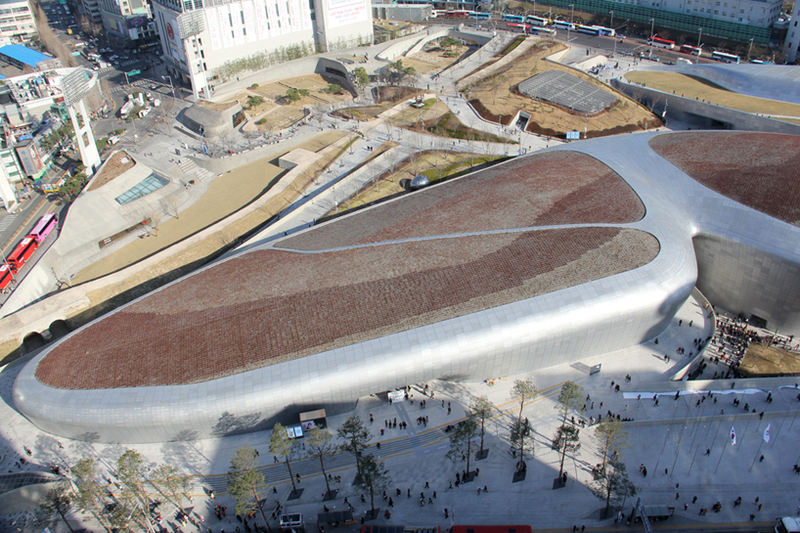 see designboom’s additional coverage of the ‘dongdaemun design plaza & park’ in advance of its official opening, including extensive interior shots here.